Samsung's Dolby Atmos soundbars get DTS 5.1 update | What Hi-Fi? 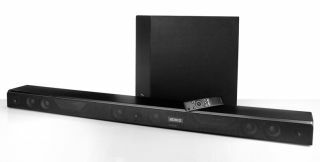 A recent firmware update, via the Samsung Multiroom app, means the soundbars can play all the 5.1 channel mixes found on most Blu-rays. Dolby Atmos soundbars are one of the easiest ways to get three-dimensional sound into your home without putting speakers in your ceiling. The K850 and K950 are Samsung's current foray into that market. They both have upfiring drivers that bounce sound around the room, giving you a more immersive movie experience. But while these soundbars were ready for surround-sound, they could only play DTS 5.1 soundtracks by downmixing to stereo. Since the majority of Blu-ray discs use multi-channel DTS mixes as their main audio tracks, lack of proper support was quite an ommission. Happily, that's now rectified with Samsung's latest firmware update. Numbered '3113', it enables the soundbars to fully support DTS mixes in true 5.1-channel audio. You can download the update by loading up the Samsung Multiroom app for iOS and Android, adding your soundbar to its speaker registry, and then hitting the 'Software Update' button.